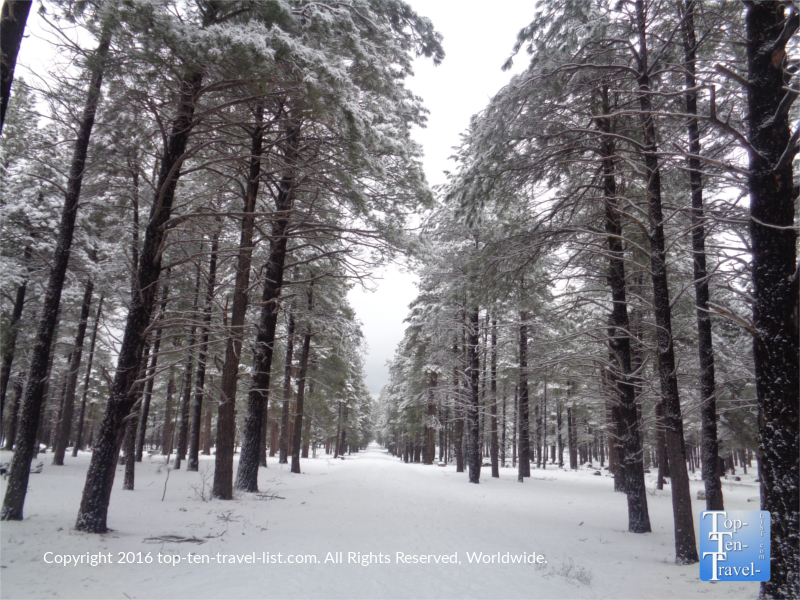 9 Things to do this Winter in Flagstaff, Arizona - Top Ten Travel Blog | Our experiences traveling throughout the US. Arizona locals (and those tourists who have visited the Northern Arizona region during the winter season) are probably well aware of Northern Arizona’s reputation as one of the Southwest’s most spectacular winter destinations. To those not familiar with the diverse terrain that make up Arizona, thoughts of cacti, palm trees, and endless strip malls may be the only thing on your mind when picturing the state. 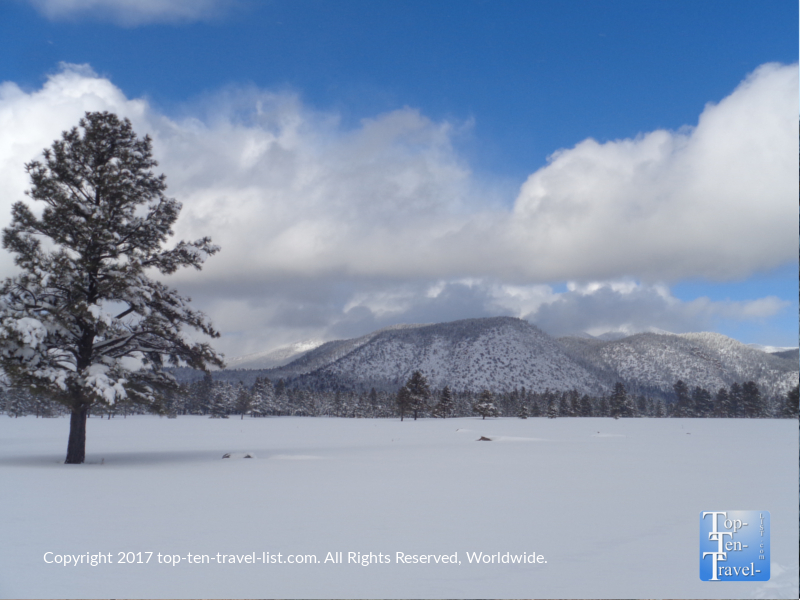 The high altitude Northern Arizona region (Flagstaff’s elevation is one of the country’s highest at 7000ft) provides plenty in the way of winter recreation, with views & activities rivaling those found at some of the more popular mountain destinations of the West. Flagstaff, the hub of the Northern Arizona region, offers pretty pine & mountain scenery (the city is located in the country’s largest ponderosa pine forest & home to the state’s largest mountain peak), 100+ inches of snow per season, and abundant winter recreational activities including the state’s premier ski resort. 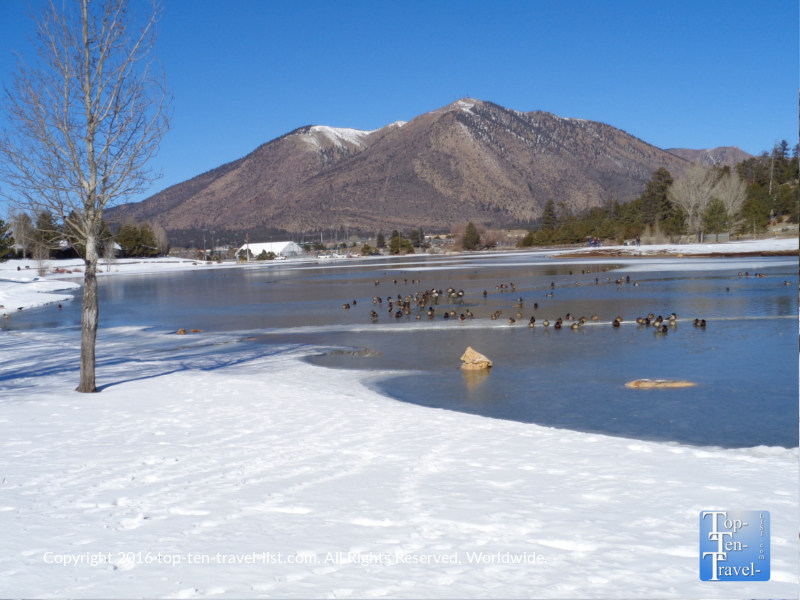 All these factors contribute to Flagstaff’s status as a winter destination like no other in the Southwest. 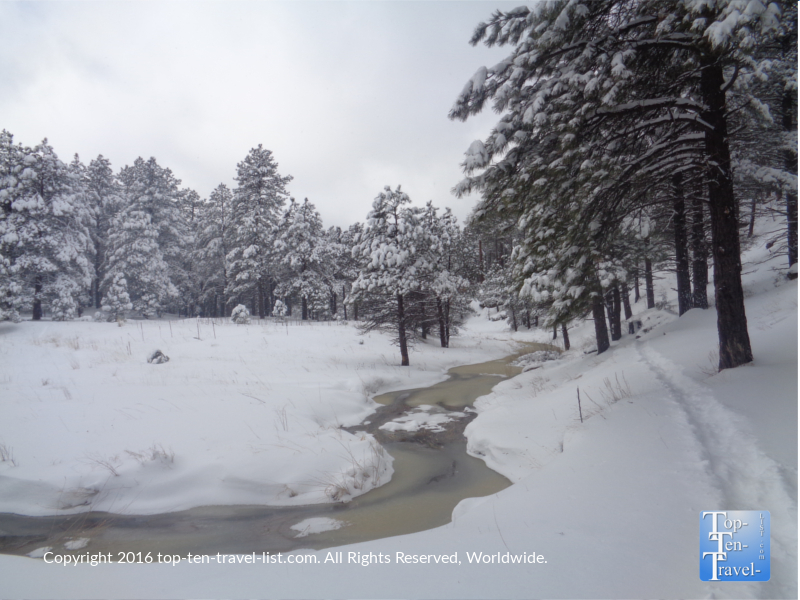 Smaller surrounding towns in the region, including the Grand Canyon & Sedona, are also no stranger to the snow. Seeing Sedona’s red rocks capped with a fresh dusting of snow truly is a once in a lifetime experience. 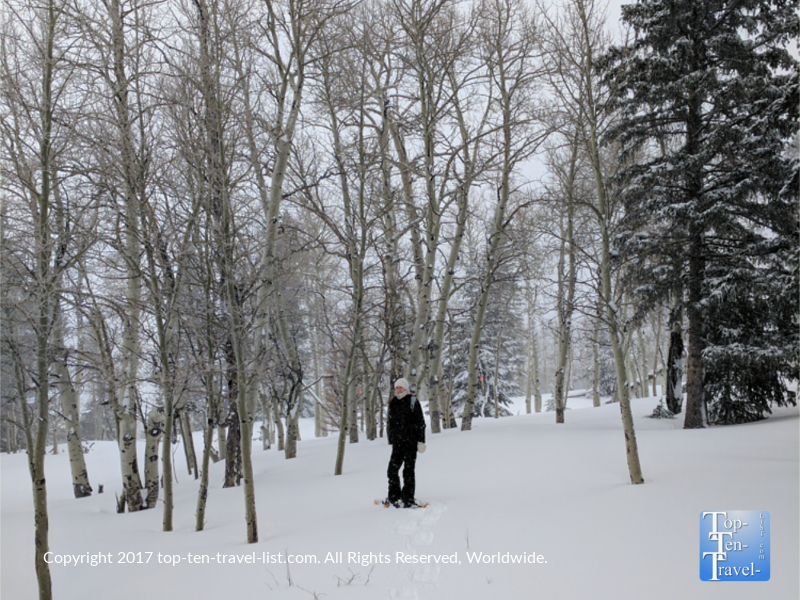 Being one of just a small number of ski resorts in the state, as well as close proximity to Phoenix (just 2 hours), Arizona’s high altitude ski resort sees no shortage of visitors all season. Featuring an average snowfall of 260 inches, Arizona’s first high speed 6 person lift, and diverse terrain, it’s no surprise that almost every weekend is a busy one at Snowbowl. One word of advice: try to plan your visit on a weekday or very early in the morning on weekends to avoid spending hours in traffic along Hwy 180. In addition to Snowbowl, Hwy 180 is on the way to a popular sledding hill, several snow play areas, the Grand Canyon, and the Nordic Center, meaning extremely congested roads unless you set your alarm and get out there early! A number of gorgeous high altitude trails can be found all around the Northern Arizona region. 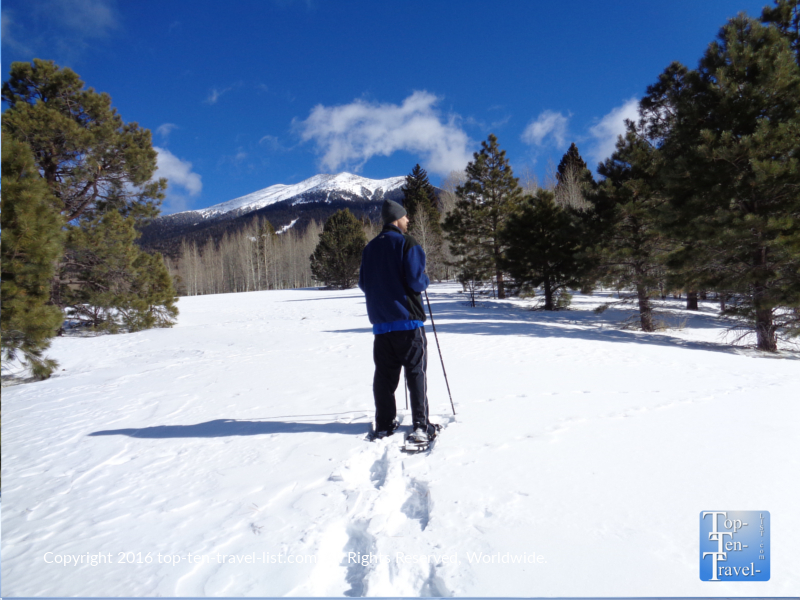 Although many of these trails are not accessible during the snowy winter season, the year-round trails at Snowbowl are just perfect for snowshoeing and/or cross country skiing. 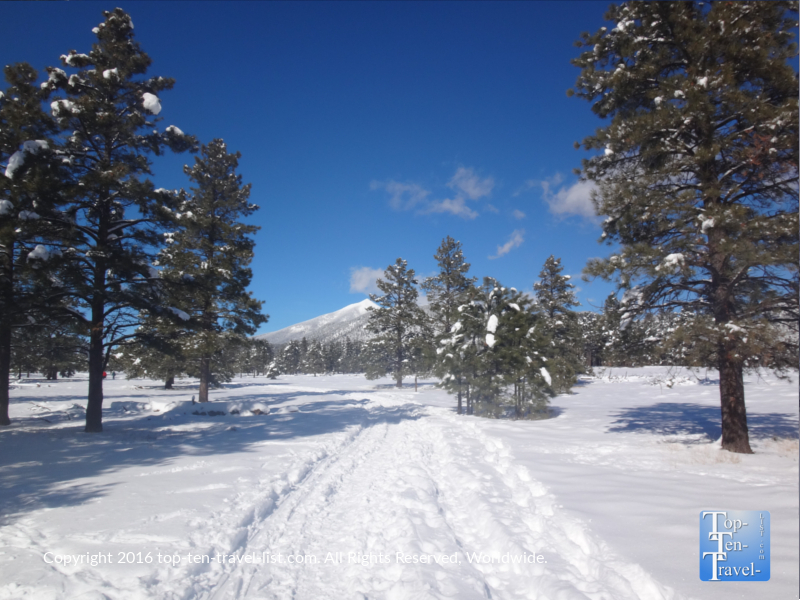 Enjoying a serene winter snowshoeing walk amongst the snowy pines and majestic snow capped mountain is the perfect alternative for any non skiers visiting Flagstaff. Another benefit of snowshoeing vs. skiing is the lack of crowds. While Snowbowl is jam packed all day long, the trails barely see any traffic. Most of the time, you will not see a single person around, making you feel as if you are in your own private winter wonderland! 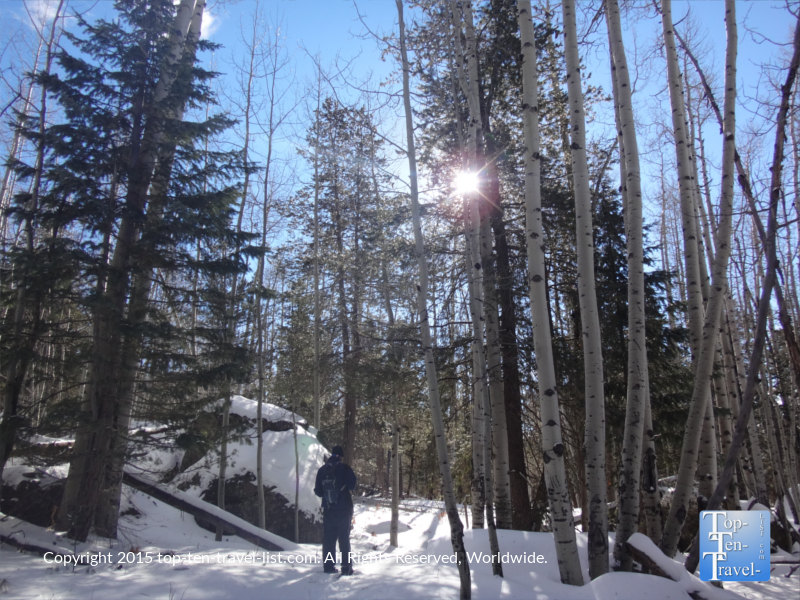 A snowshoeing adventure along the beautiful Kachina Trail, lined with tall pines and aspens. 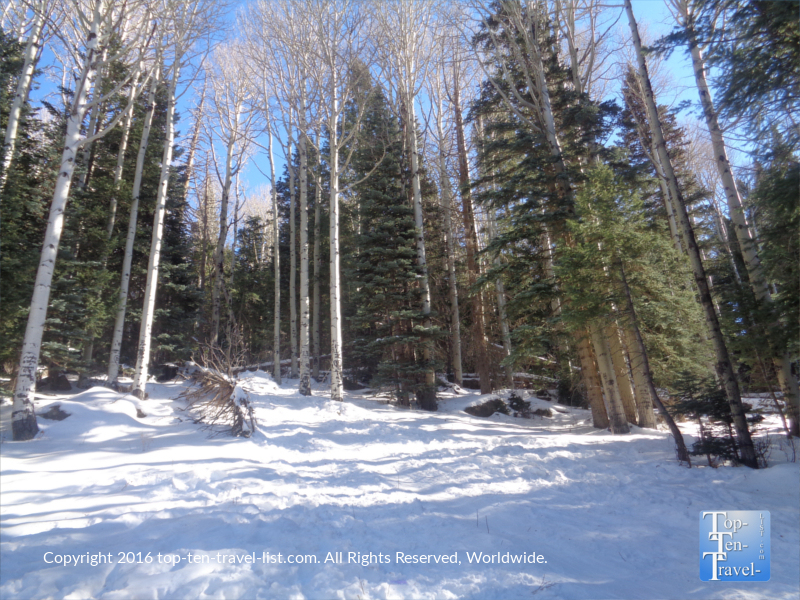 Check out the Aspen Nature Loop or Kachina Trail – 2 relatively flat trails with great scenery. Another option is to pick up a backcountry pass and enjoy Veit Springs trail, a nice flat & easy trail located about 5 miles up Snowbowl Rd. 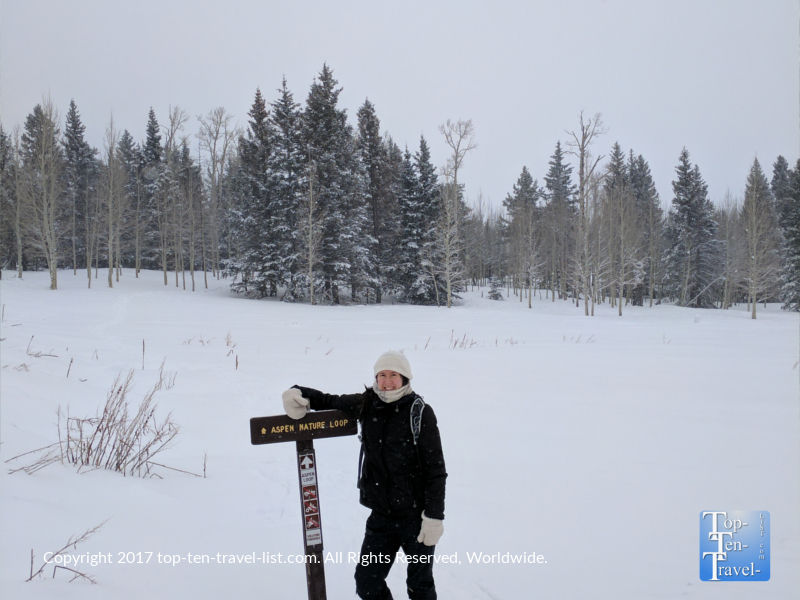 Be aware that all 3 of these trails are strenuous year-round due to the high elevation (8000-9000ft), even more so when doing an intense cardio activity like snowshoeing. Drink extra water and take it easy! As mentioned above, weekdays and early mornings on the weekend are your best bets for avoiding stressful ski traffic. For such a small town, Flagstaff really offers an impressive local coffee scene. While you will encounter the standard chains like Dunkin’ Donuts and Starbucks, as well as seemingly endless drive-thrus (the super popular Dutch Bros), a visit to a cozy independent shop is a much better value, not to mention a great place to warm up after a long day on the slopes! 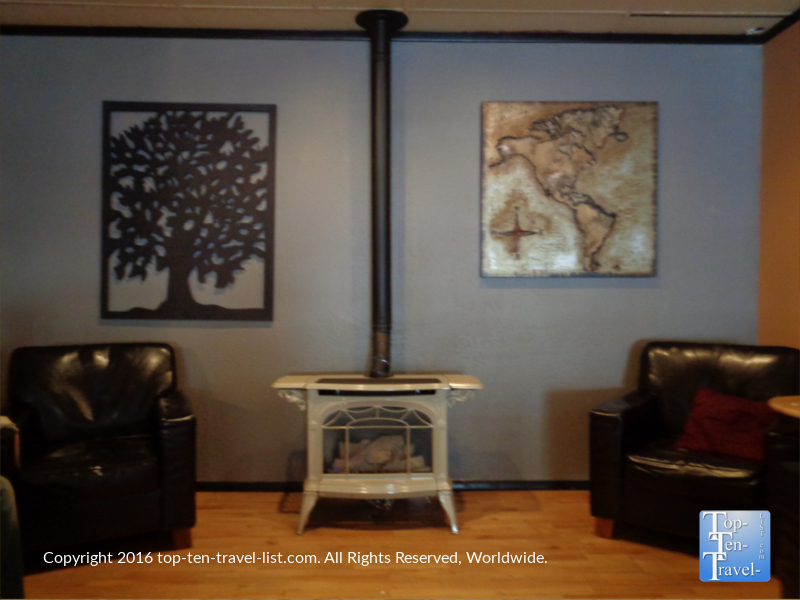 Flagstaff offers several great local coffee houses where you can fuel up with an espresso and pastry or kick back and relax next to the fireplace after a cold day out in the snow. 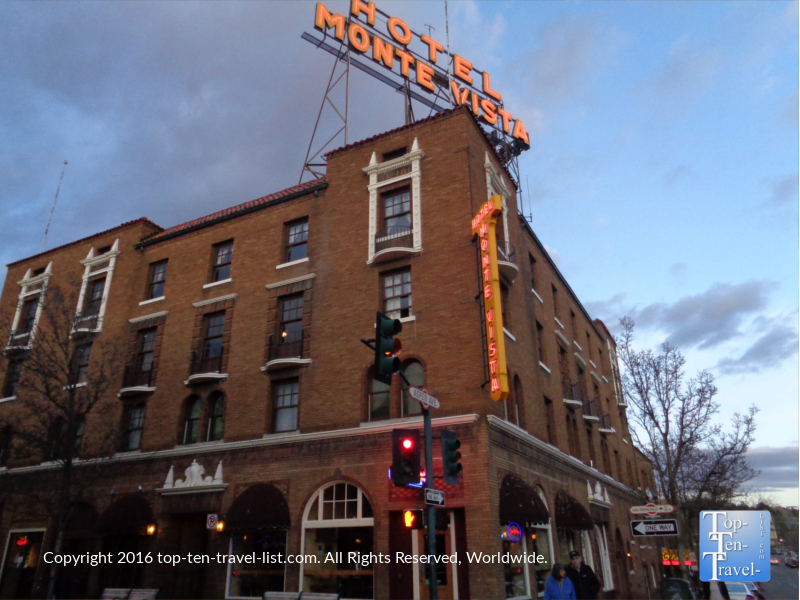 The historic Monte Vista hotel (one of the country’s most haunted!) is home to a cute little coffee shop where you can people watch while sipping on a quality espresso drink. Late for the Train offers a creative selection of daily mochas, along with holiday specials. Try the Dark Skies – a chocolate delight! A perfect American at Late for the Train, serving rich, dark roast coffee without any hint of burnt flavor! 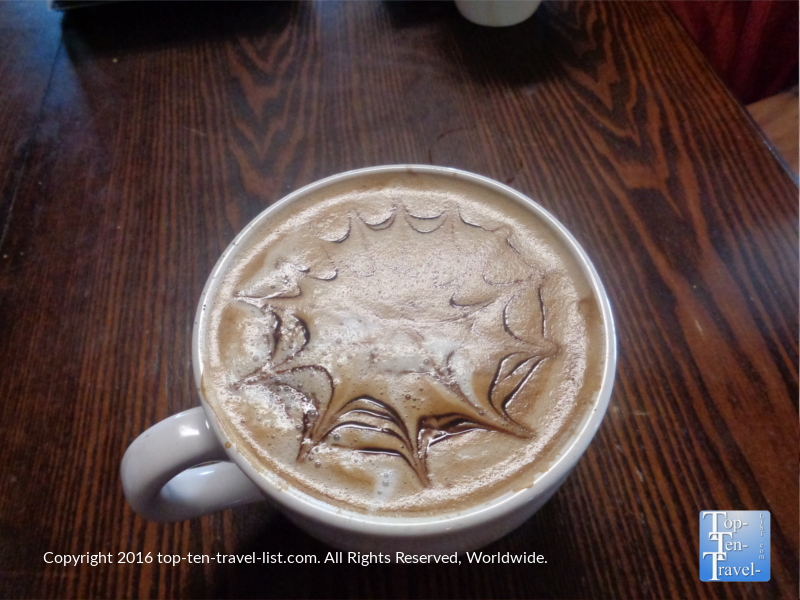 Great mochas too – try the Dark Skies! White Dove offers a cozy ambiance not found at other Flagstaff coffeehouses. Late for the Train is the best choice due to the convenient location on Hwy 180 en route to winter attractions. Expertly made espresso drinks & delicious breakfast burritos keep me coming back to Late for the Train over other local choices. Other decent coffeehouses include White Dove and Kickstand, both offering a cozy fireplace and couches and a wonderful drink menu featuring several creative mochas (try the White Chocolate at White Dove & the Endo at Kickstand!). Whether enjoying a quick pick me up prior to hitting the slopes, or simply looking to warm up from Flagstaff’s oftentimes brutally cold winter weather, a stop at one of the city’s independent coffee shops is a must! 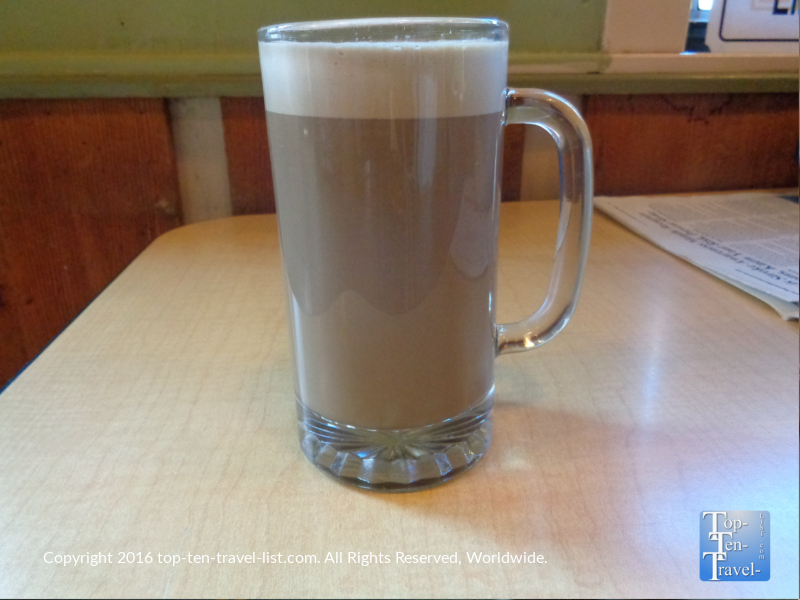 Check out my 5 favorite Flagstaff coffeehouses. Unfortunately, the Arizona Nordic Village is often overlooked due to the more popular and heavily advertised Snowbowl. 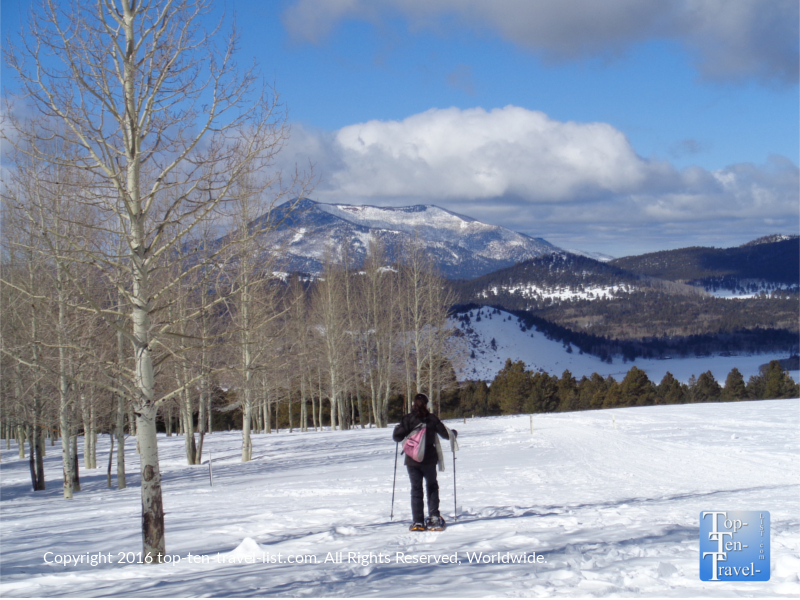 For a more relaxing day out on the powder without the hefty crowds, consider a cross country skiing adventure at the Nordic Center. 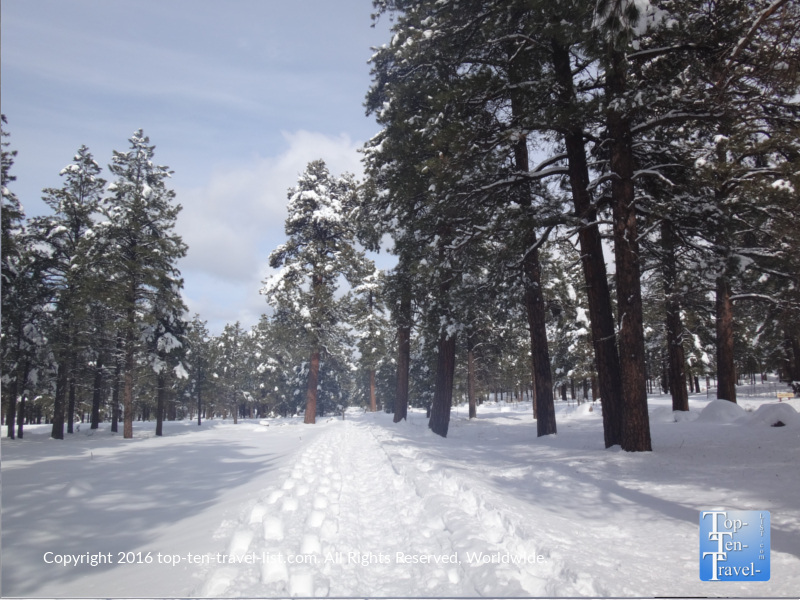 This wonderful ski center offer a number of groomed trails for all levels in the the gorgeous ponderosa pine setting. 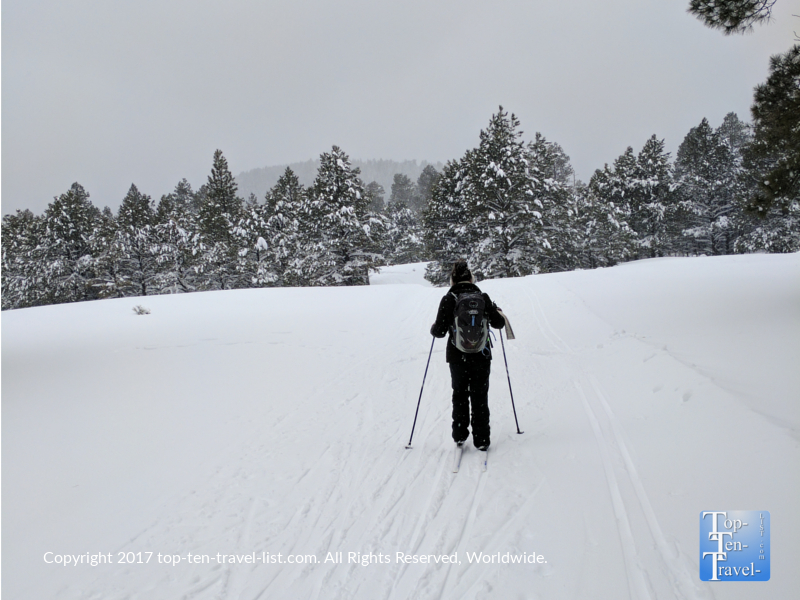 It’s a wonderful way to spend a winter day out in Flagstaff, a bit pricey, however, much cheaper in comparison to rentals and lift tickets at the pricey Snowbowl. Every Friday night, discount lift and rental packages are offered. Also check Groupon for special deals. Although the high altitude trails at Snowbowl are often covered with a foot plus of snow all season long, the snow in town tends to melt very fast following a storm, due to endless sunny skies and mild daytime temps. On the bright side, the warmer daytime temps (averages in the 40s-50s) means most of the lower altitude trails are accessible year-round. 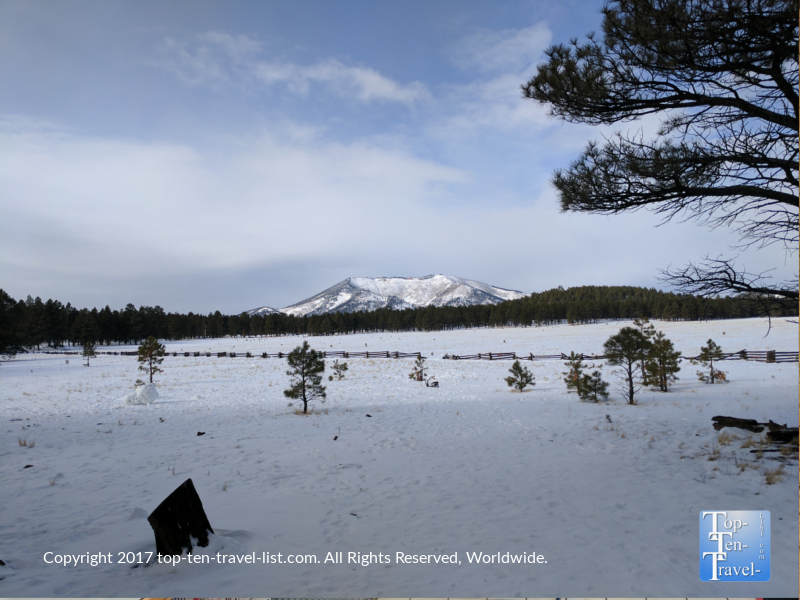 While there may not be enough snow on the ground for snowshoeing/cross country skiing, the beautiful San Francisco Peaks and Mt. Elden are often capped with snow most of the season. Kendrick Watchable Wildlife Park along Hwy 180 – a great place for a winter stroll! To enjoy some of the best mountain landscapes in town, head over to Buffalo Park for a 2 mile stroll with gorgeous views of the mountains. 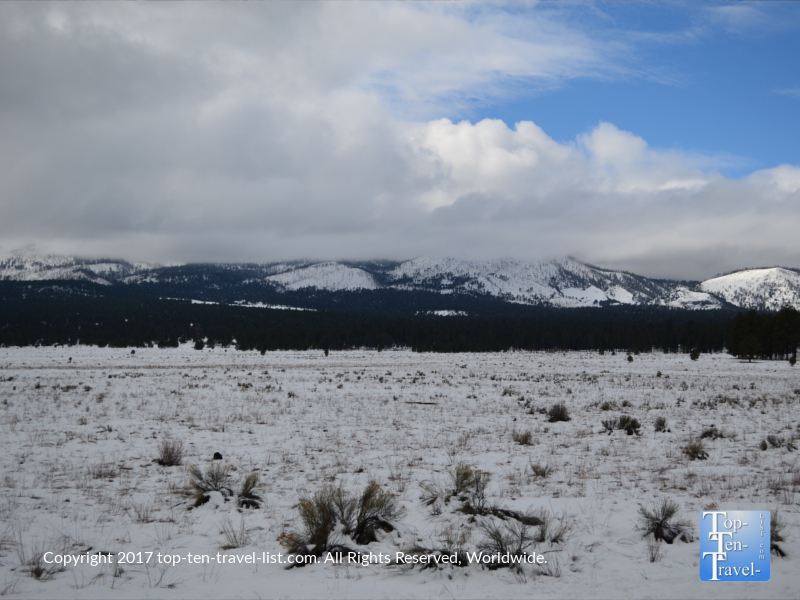 Other great trails to check out during the winter season include the 11 mile loop system at Cambpell Mesa and Ft. Tuthill, both of which are relatively flat trails with gorgeous pine scenery. Right after a major snowstorm (ideally within a day or 2) is your best bet to snowshoe or ski on these low altitude trails, otherwise winter boots will probably do. Whether skiing or walking, the snow capped peaks sure make a stunning backdrop for photos! For those not interested in skiing or snowshoeing, sledding is always a fun alternative for both the young and young at heart. 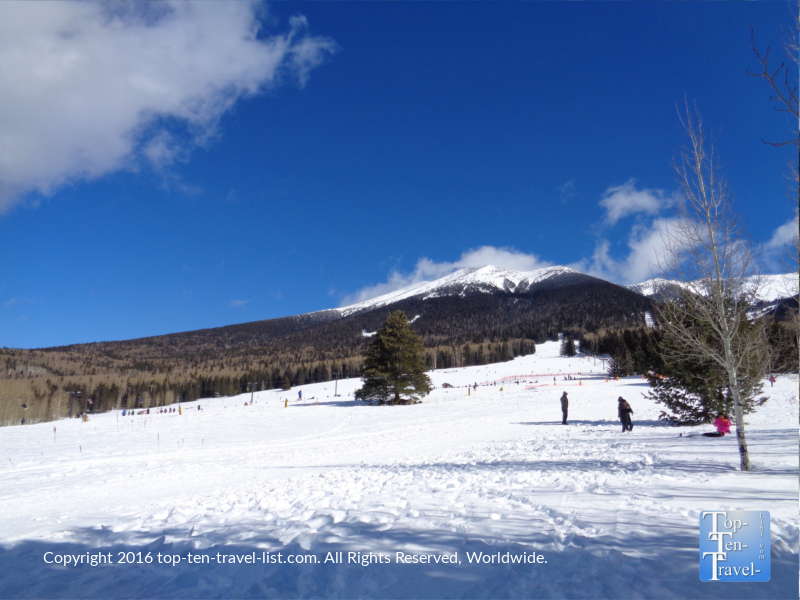 Flagstaff is home to a number of snow play areas, including the free Crowley Pit along Hwy 180 (although it gets very congested), Wing Mountain, and the new Fort Tuthill Snow Play area, which just opened this season, and thus, is less crowded (for now). For a less crowded and budget friendly alternative, simply head to any local park after a big snowstorm. Fort Tuthill and Thorpe Park are both great options – although keep in mind that the snow melts so fast here, hence the popularity of the high altitude sledding areas. A stuffed chicken sopaipilla (What Guy Ate) and Roasted Veggie burrito at Salsa Brava. After a long day of exciting, yet exhausting winter sports, you can really work up an appetite. 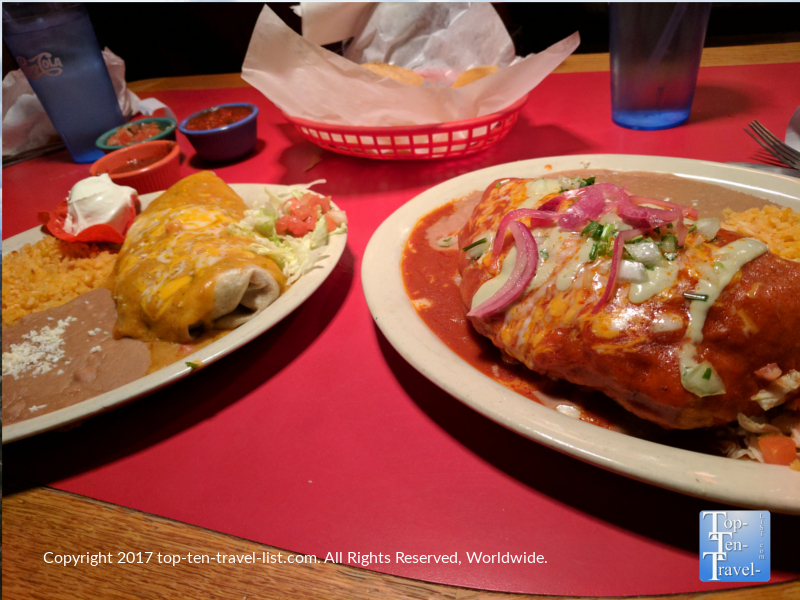 While Flagstaff has many chains, the small city is also home to an impressive selection of local restaurants, with everything from casual American joints, to Southwestern Mexican fare, to trendy sushi places downtown. The city is becoming more well known for its’ diverse culinary offerings and the downtown is packed on any given night with both tourists and locals enjoying the local food scene. A delicious breakfast at Brandy’s including the Spud’s Medley (eggs and potatoes topped with cheese, veggies and sour cream) and a 3 ingredient omelet with a side of fluffy pancakes. 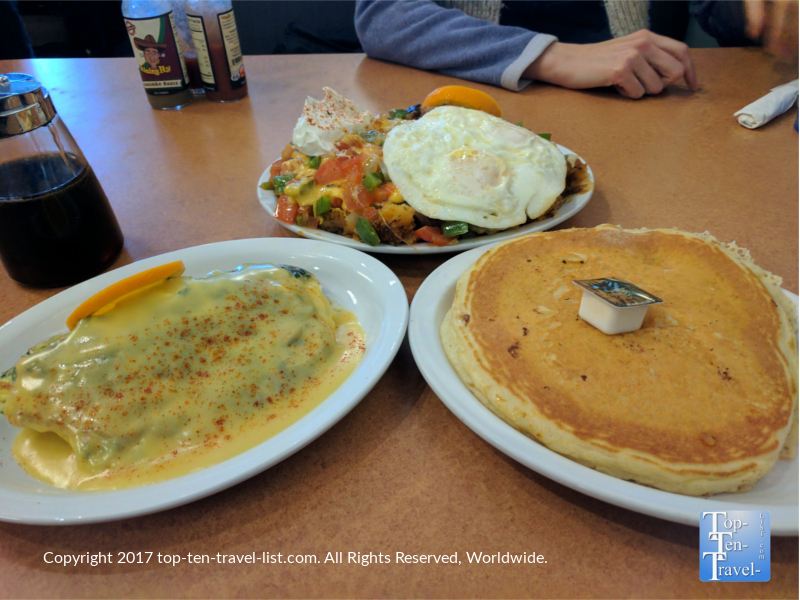 This casual diner is a great place to fill up before any outdoor activity -eating a filling meal is a must-do before any intense activity in the high altitude! 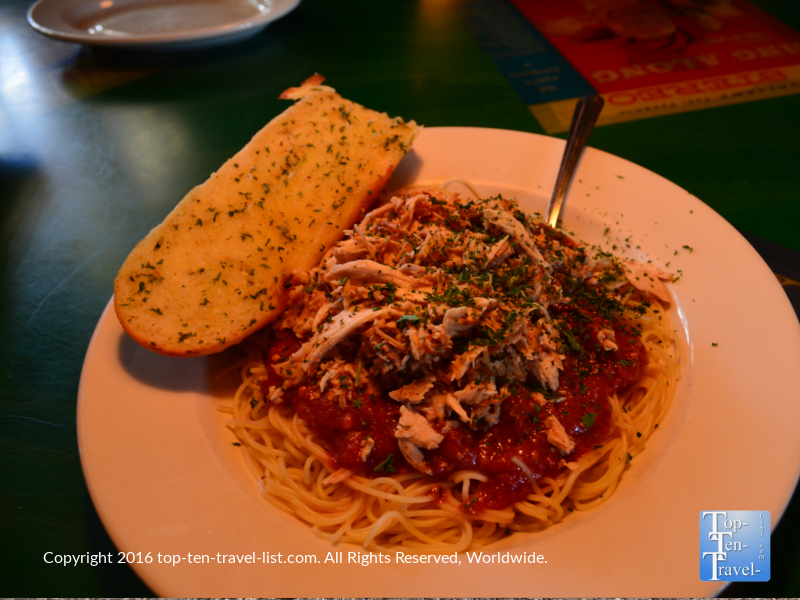 The unlimited Bowl O’Pasta at Oregano’s – angel hair & marinara with a tasty side of breakfast. Treat yourself to this carb heavy meal after a long day out on the slopes! 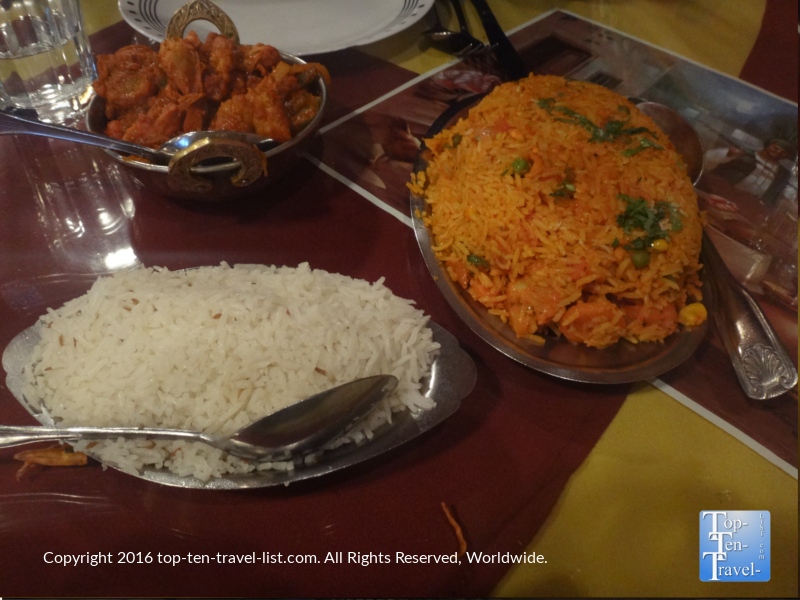 Delhi Palace – the most delicious Indian food ever! Even better after any intense outdoor activity! Salsa Brava, a tasty local Mexican restaurant known for its’ endless salsa bar and Brandy’s, a homestyle American diner, are both Rt 66 favorites which have been featured on Food Network’s Diners, Drive Ins, and Dives. For some hearty Italian fare after a long hike, check out Oregano’s (featuring big portions of hearty Chicago style Italian fare) or Delhi Palace, a wonderful Indian restaurant with the most delicious lunch buffet around. 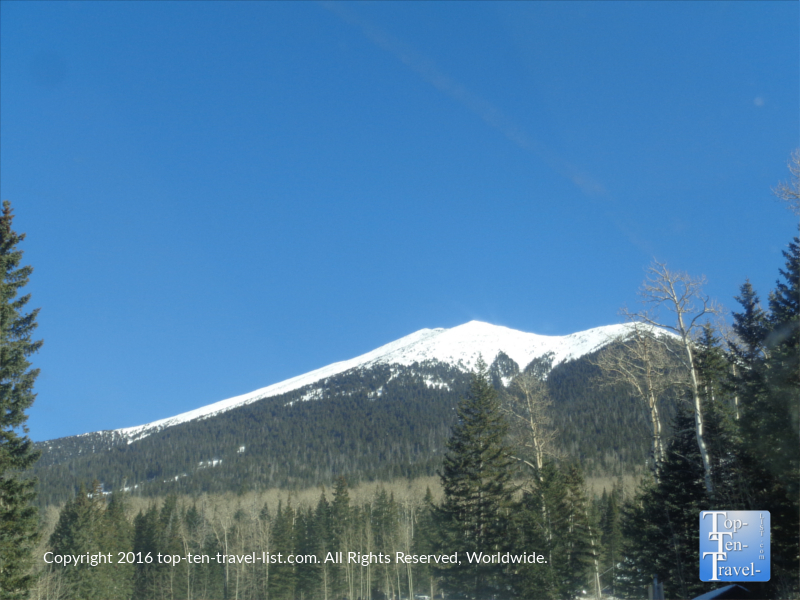 A scenic winter drive up Snowbowl Rd. 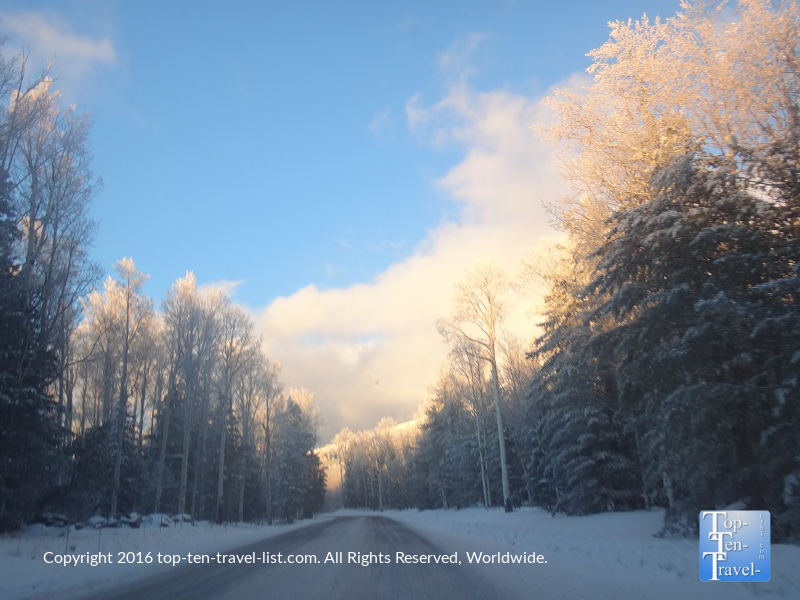 Winter is as good a time as any to enjoy one of Northern Arizona’s scenic drives. 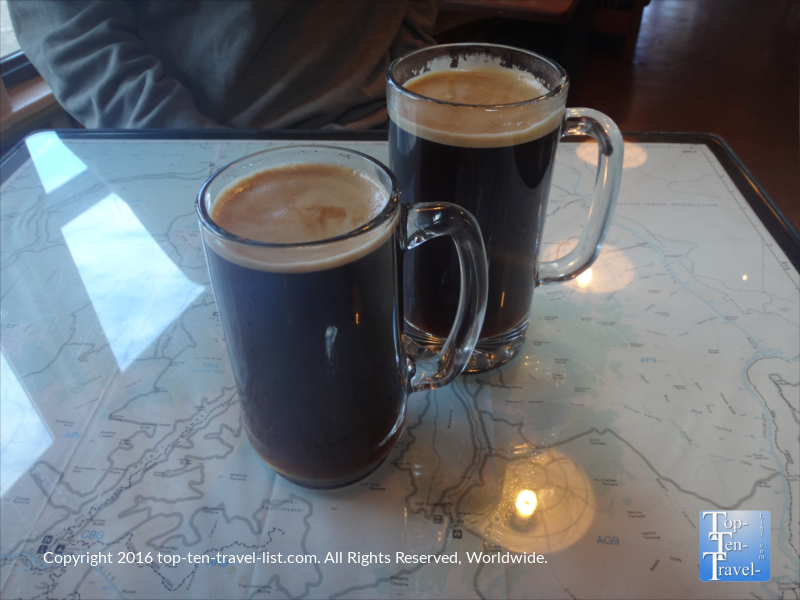 Grab a coffee (I recommend Late for the Train or White Dove), and plan for a cruise up Snowbowl Road or Oak Creek Canyon. Both of these drives are absolutely stunning, and if you have the time, you really should do both. 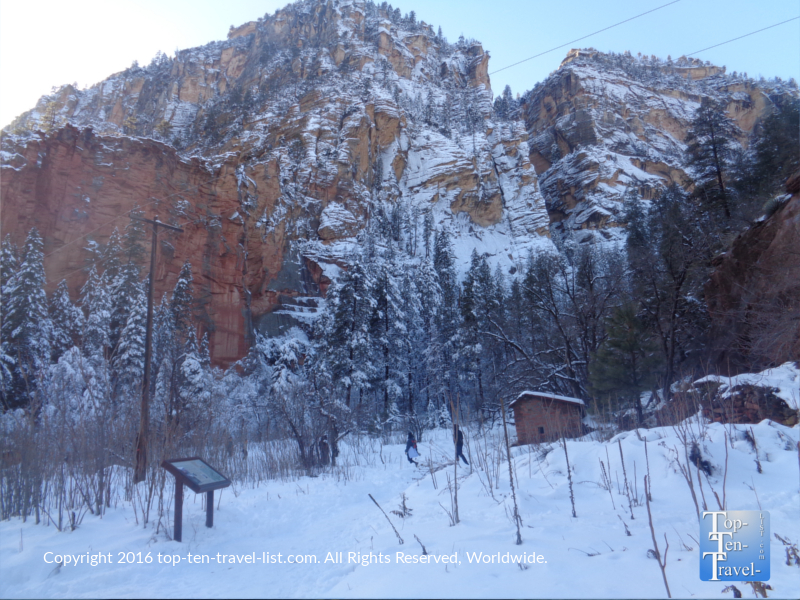 While Snowbowl Road offers dramatic vistas of the pines, aspens, and snow capped mountains, Oak Creek Canyon features striking views of Sedona’s towering red rock formations, peaceful views of the perennial Oak Creek, as well as dramatic landscapes of the gorgeous ponderosa pine forests. 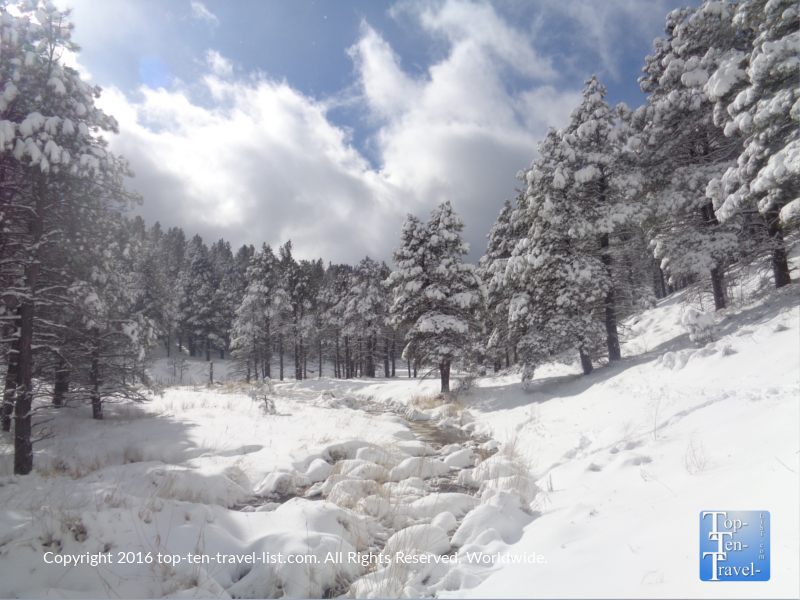 Snowbowl Rd is a 7 or so mile drive which begins just a few miles outside of Flagstaff. Near the top there is a wonderful overlook of the mountains, which is particularly attractive at sunset. From here, you can check out the trails at Snowbowl, ski, or simply take a few photos of the gorgeous landscapes. 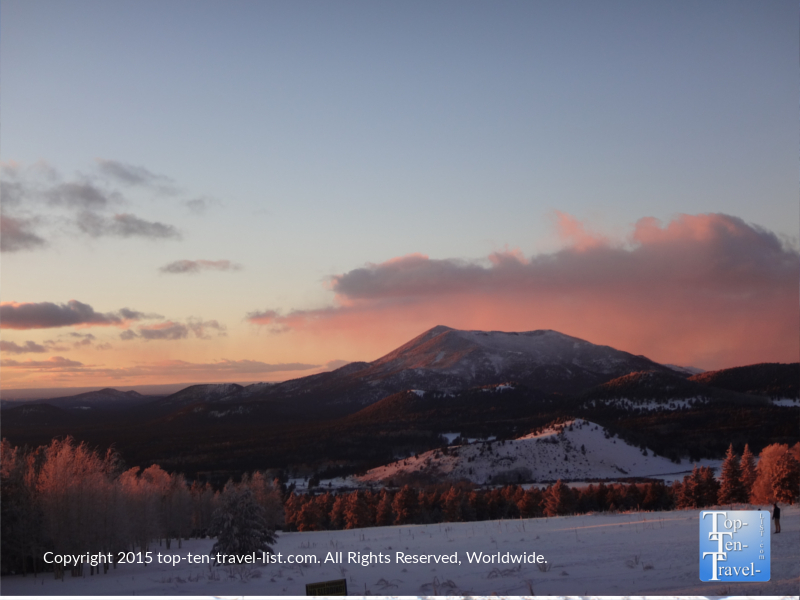 Arizona Snowbowl is one of your best bets for a gorgeous sunset! Oak Creek Canyon also begins just outside of town – along 89a – as it slowly winds its’ way through 14 miles of diverse landscapes. As the elevation begins at 7000 feet in Flagstaff and drops to near 4000ft in Sedona, the views are amongst the most diverse & spectacular anywhere in the West. 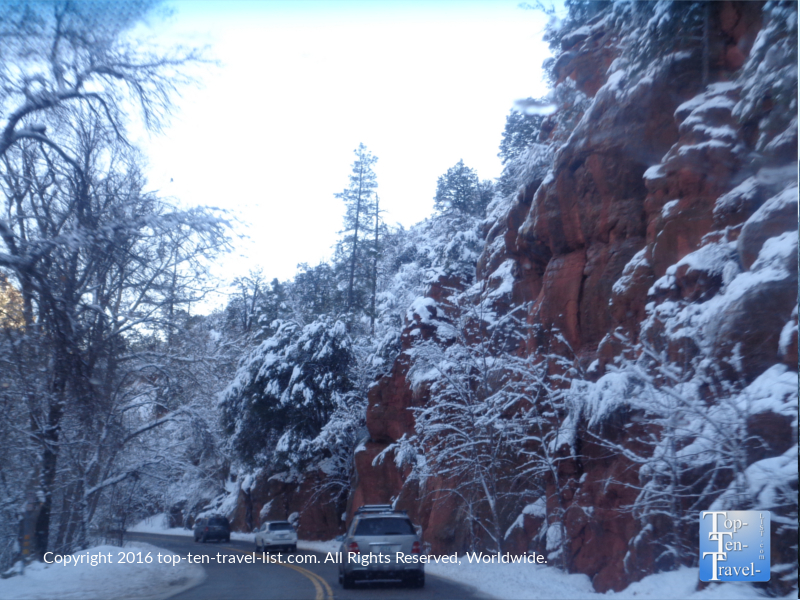 Driving through a red rock winter wonderland on Oak Creek Canyon scenic drive. 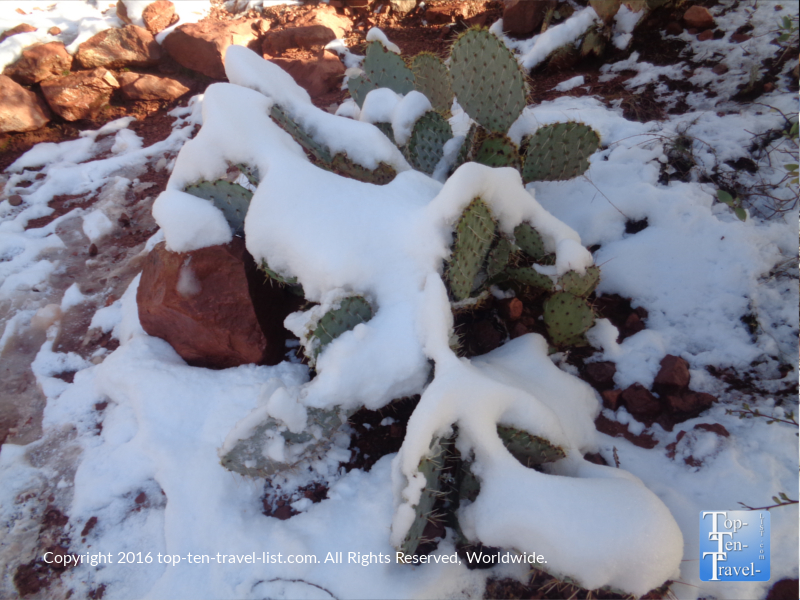 For a real jaw dropping experience, drive Oak Creek just after a winter storm – seeing the red rocks and a prickly pear cactus dusted with snow is such an awe inspiring experience! Oh, and be sure to stop for breakfast at the wonderful Indian Gardens! A winter stroll along West Fork and shopping for Native American crafts at the Oak Creek overlook are also recommended. Sunset-Wupatki Scenic Loop drive is yet another option. 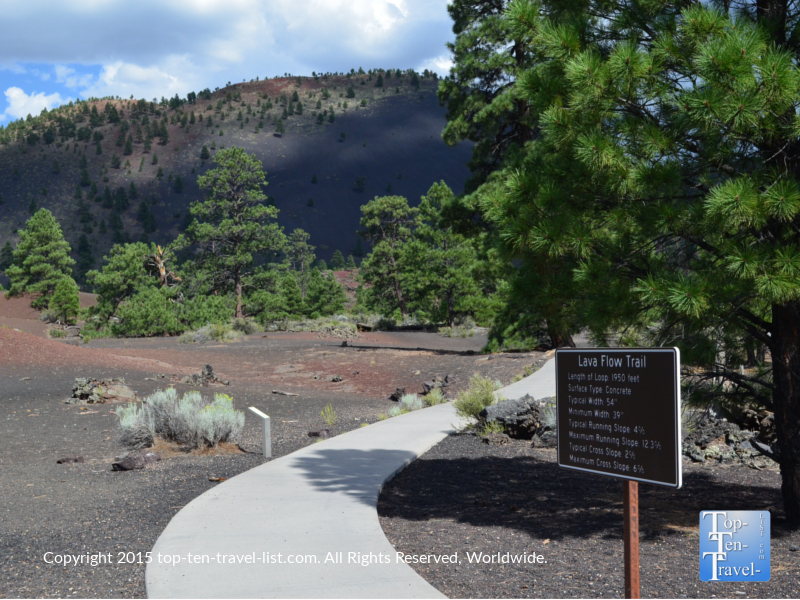 If you do decide on this drive, be sure to visit both Sunset Crater (a 900+ year old volcano) and Wupataki (where you can explore ancient Indian dwellings from as far back as 1100AD), as both are amazing national monuments (and both are included together with your admission). The scenic drive and visits to both national monuments easily fill up a half day itinerary, making for a great value in a pricey area. An up-close look at a piece of ancient petrified wood. 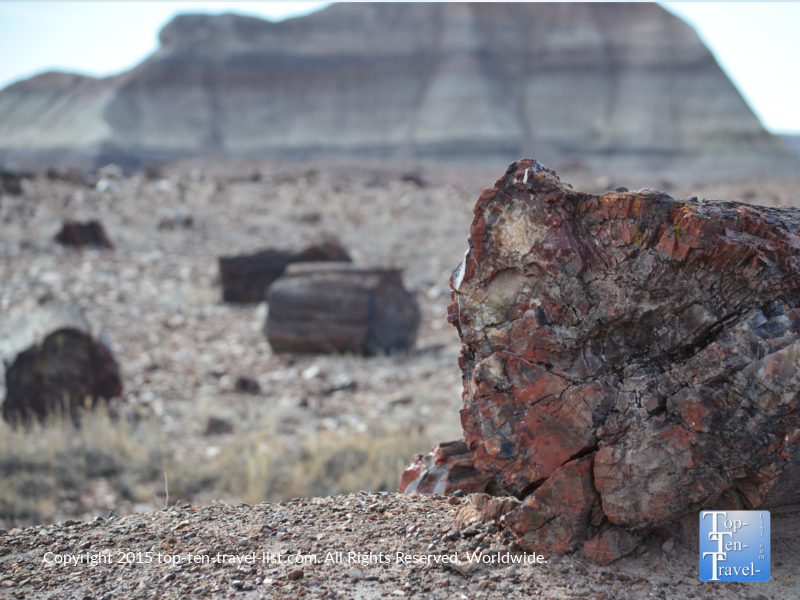 A day trip the Petrified National Forest, just 1.5hrs away, is a must! A winter visit is most recommended as temps will be about 30 degrees cooler than the gruesome 90-100 degree summer heat! Northern Arizona is home to seemingly endless natural wonders, hence the reason why so many tourists from around the world flock to the area each year (Flagstaff alone sees over 5 million tourists per year!). 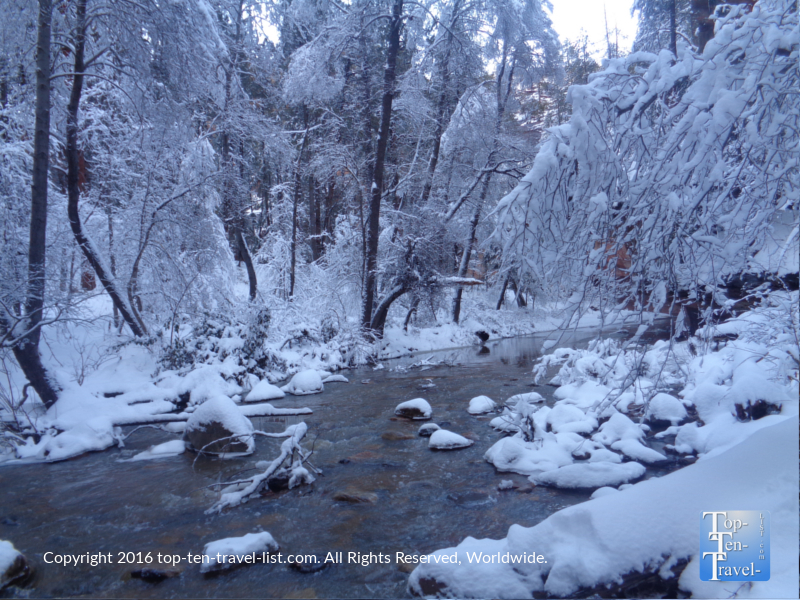 Advantages of a winter visit include fewer crowds and cooler temperatures, although some roads and trails (especially at the Grand Canyon) may be closed after a major snowstorm. 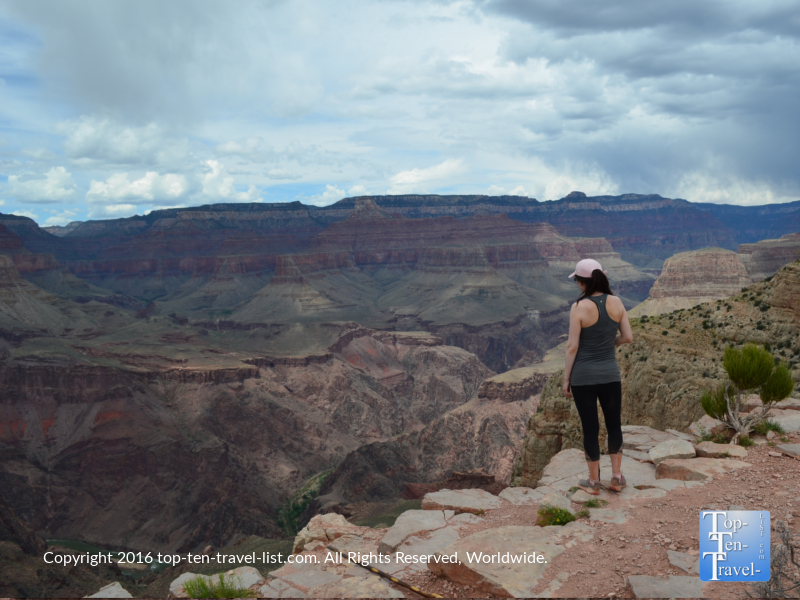 Visiting the South Rim of the Grand Canyon is a must, hiking the Grand Canyon is even better! Check out the amazing South Kalibab trail: an amazing workout with incredible views! Along, the Lava Flow trail, you will be able to explore the ruins of a 900 year old volcano. 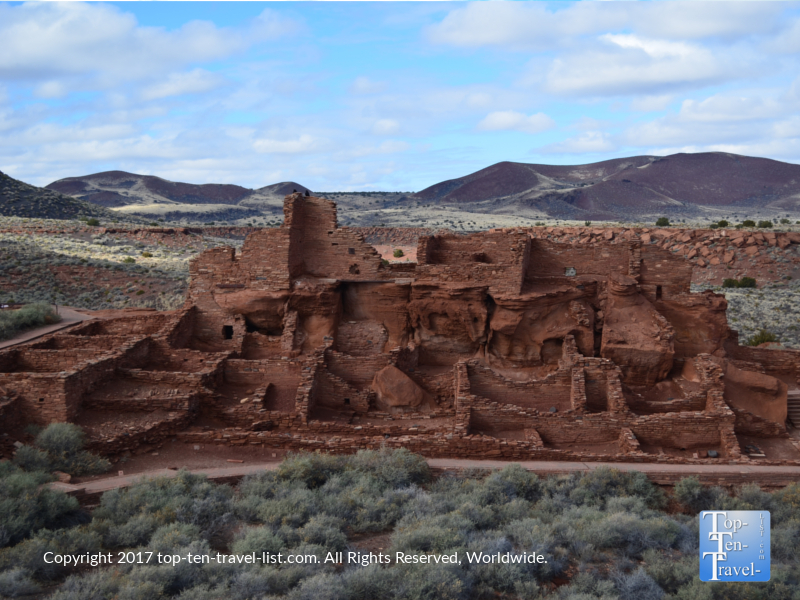 At Wupatki, you will be able to explore ancient ruins dating back to 1100. 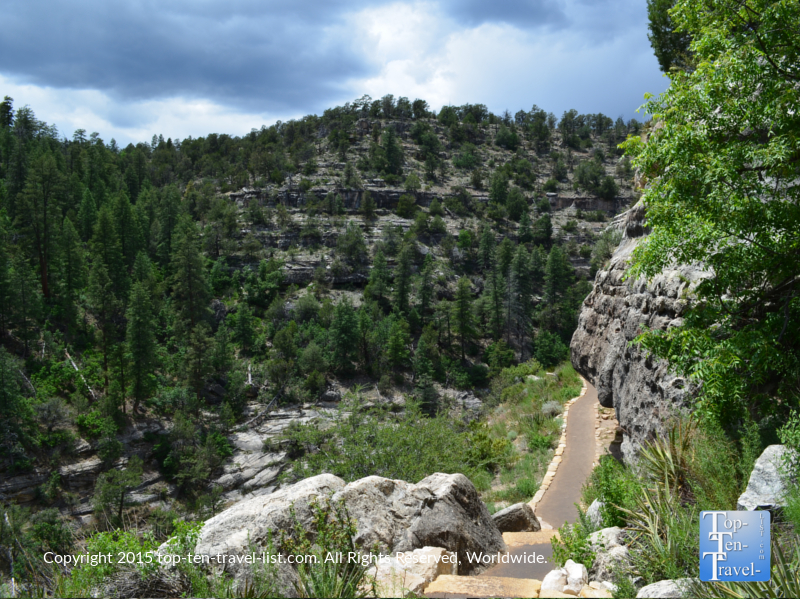 Check out the Island trail at Walnut Canyon. Here you will be able to explore ancient cliff dwellings and also take in the majestic landscapes surrounding this area. 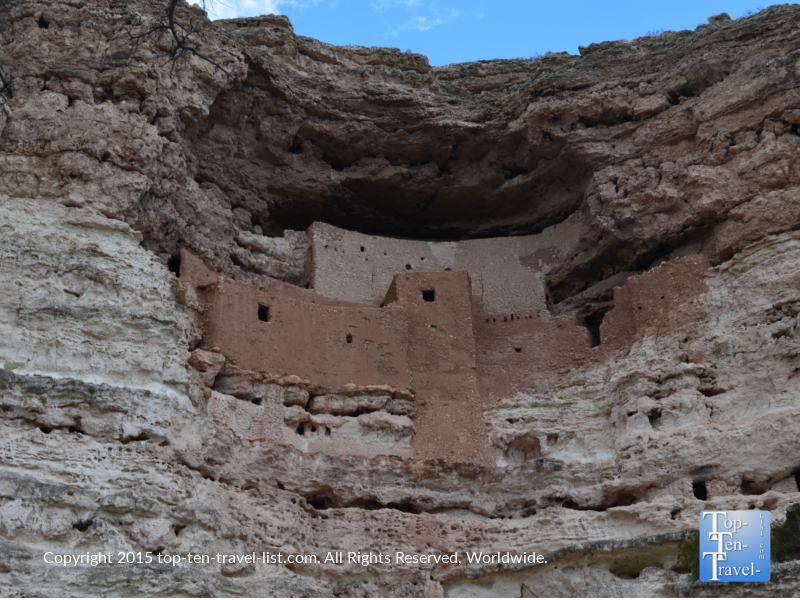 Montezuma Castle, one of the country’s best preserved cliff dwellings, is less than an hour from Flagstaff. Like most other attractions in the region, the winter is a prime time to visit due to the intense summer heat in the desert. 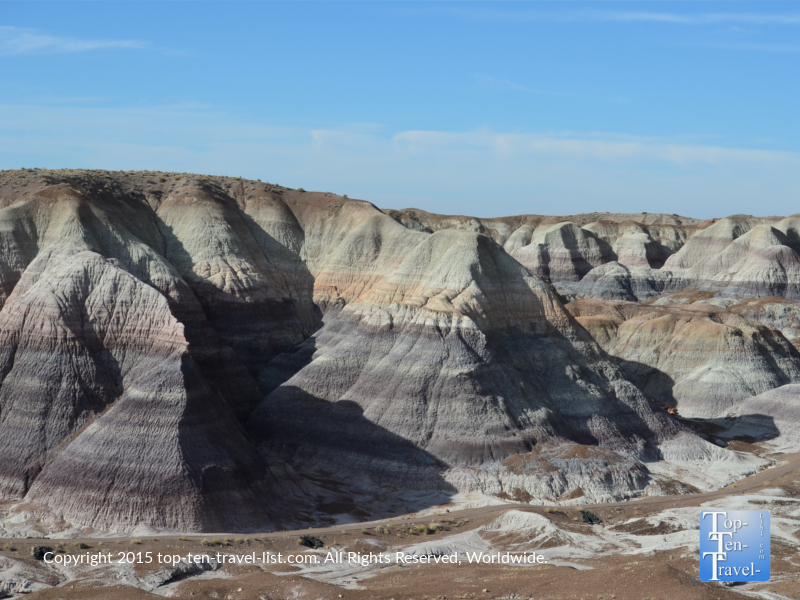 A scenic overlook of the Painted Desert at the Petrified Forest. Be sure to check out one of the gorgeous trails! Horseshoe Bend – a unique curved shaped to the Colorado River. What a gorgeous natural sight! 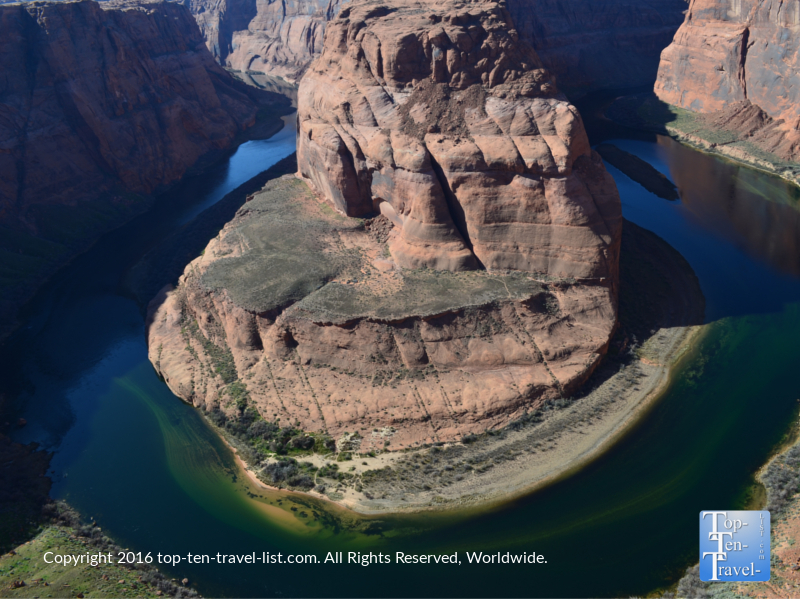 Although a trip to the Grand Canyon is a must, there are many other natural wonders to add to your to-do list including Sunset Crater, Wupatki, Walnut Canyon, Montezuma Castle, and the Petrified National Forest. If you are up for a longer day trip, Horseshoe Bend and Antelope Canyon near Page (2.5 hours away) is another worthy addition. This time of the year is a great time to get out there and explore these gorgeous natural wonders in a less hectic, less extreme environment. Tips for a smooth visit: Drink plenty of water & avoid alcohol to avoid dehydration and mountain sickness. Dress in layers as winter temps vary drastically day to night. Be prepared for very cold morning & night temperatures. Plan on winter activities early in the mornings to avoid traffic & crowds. Book your hotel way in advance for better rates.